Fortnite Battle Royale’s weekly content update has rolled out on iOS, adding the new Port-a-Fort grenade, squad commands, and more. Epic has also addressed a whole bunch of pesky bugs — including one that caused weapons to hover in the air when switching quickly between items. There are big changes for consoler and PC players, too. Fortnite’s weekly updates that add new content ensure the game always feels fresh — even if you put a ton of hours into it. 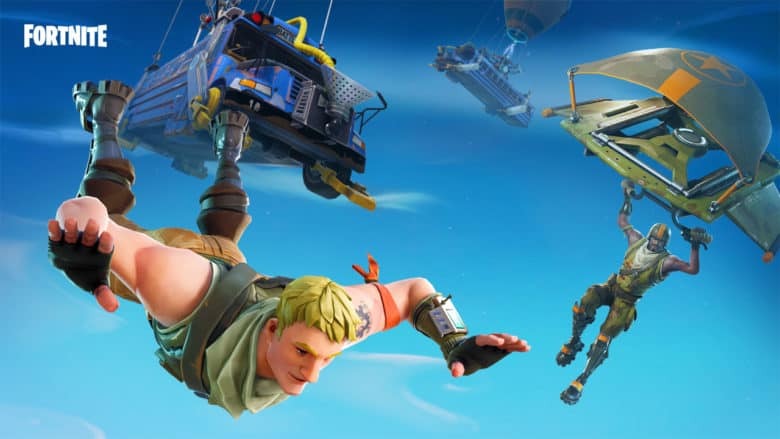 It’s one of the things that has made Epic’s take on the battle royale genre so incredibly popular. This week’s update, version 3.5, is another big one. The hot new item is the Port-a-Fort, and it’s available across all platforms — including mobile. It’s a grenade-like device that you throw on the ground and it instantly builds you a fort that provides cover and a height advantage over enemy players. The fort, made out of metal, is three stories high with a door on the ground floor for access, and it has tires inside that you can use to quickly bounce to the top. Epic’s new video below shows the Port-a-Fort in action. This week’s limited-time game mode, which will be added soon, is an improved version of the 50v50 game. It’s pretty self-explanatory; two massive teams, each with 50 players, battle it out to win. You’ll be able to complete challeneges in this game mode, but stats aren’t recorded. Epic has also added a new squad communications feature for those who prefer not to use voice chat. You’ll find it inside the emotes menu on mobile, and you can use it to provide information to your team. Commands include “enemy spotted,” “need shields,” “need meds,” etc. Those with jailbroken devices will automatically be kicked when attempting to play. Console and PC players can now enjoy a new replay feature, which lets you save and relive your best games. It supports various camera angles, the ability to slow down or speed up the action, and more. There’s no word on if or when this will come to mobile for now. Epic has made a whole bunch of bug fixes and weapon balance changes across mobile, console, and PC. There are too many to list here, but if you’re interested in the complete list of changes, you’ll find it on the Fortnite blog. You can download the latest version of Fortnite Battle Royale from the App Store now. You will also need to download the latest content when you start the game for the first time. Just in case you weren’t aware, Fortnite on iOS can now be enjoyed without an invite.